In Wallonia, more than 50% of small businesses do not yet have an adequate website! 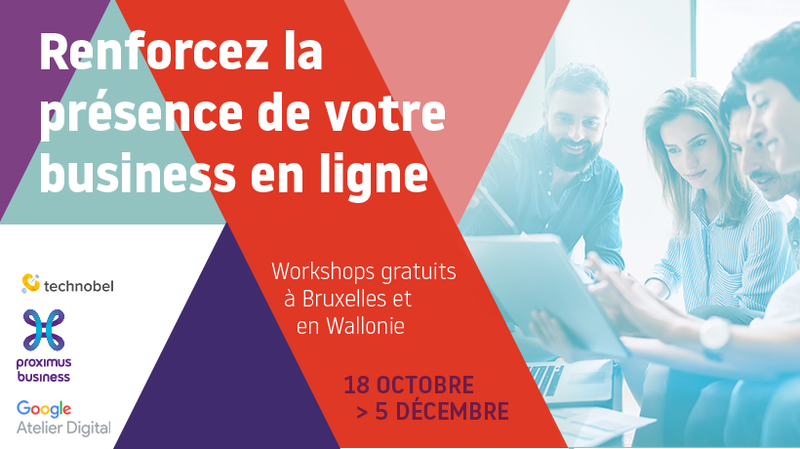 Walloon entrepreneurs understand the importance of digital transformation and are beginning to adapt to it, but the Agence du Numérique (Digital Agency) has highlighted aspects that can be improved upon. This is the picture that emerges from the 2018 Barometer of digital maturity of Walloon companies published today. In a joint initiative, Proximus, Google and Technobel are offering the self-employed and small businesses a series of training courses aimed at raising awareness of digital issues. In terms of "basic" digital infrastructure, our companies now commonly work with computers and a broadband Internet connection. But the barometer has shown that only 41% of them have a website, with a slight increase being recorded (+1). With regard to digital transformation and business strategy, it can be seen that Walloon companies have widely adopted the digital channel but do not use it enough to enable them to offer new value-added services to their customers or reinvent and expand their business. Only 47% of the companies use social media professionally, only 13% of the websites allow you to order products and services online and only 10% have trained at least one of their employees in a digital medium in 2017. Proximus' latest national surveys on telecommunications conducted among professional customers of the small enterprise segment show exactly the same trend as the barometer of the AdN. It can be seen that a little over 50% of the self-employed and small businesses do not yet have a website. And of the other 50% that have a website, only 22% of them use it actively. The consequence of a website that is not active is that it will not work as it will have a low ranking on Google and have less chance of generating traffic and turnover. The difficulties that entrepreneurs encounter with regard to digitalization are often a lack of information and digital skills in-house, along with a lack of time. All these things show, more than ever, how awareness-raising measures on digital issues are still relevant to help local companies to digitalize. The need for ongoing training, both for company employees and directors, remains a major priority. Due to the speed at which technologies are emerging on the market and their impact on all professions, there is an urgent need to broaden and deepen everyone's digital skills. Advice to ensure their website is suitable for all types of devices: smartphones, tablets and computers. This is not an isolated initiative: it supplements others such as the 50 "Bizz Smartcafé" sessions given in 2017 in Proximus points-of-sale and more recently, the training courses in connection with the Google Digital Workshop, which were started in 2018 and are still ongoing. Proximus takes on the role of digital partner of the self-employed and small enterprises to guide and educate them in this digital transformation, as they lack the time and technical skills required for this. These training courses have no commercial purpose: no products or services are offered here. But the findings outlined above have prompted Proximus' marketing teams to develop a new online presence creation offering geared to the needs of small enterprises. This simple and turnkey offering enables small enterprises to concentrate on what is truly important for them: their business and their customers. The 2018 barometer of digital maturity of Walloon companies is available on www.digitalwallonia.be/entreprises2018. Dates and locations of the Workshops: www.proximus.be/workshops.